Hundreds of images flash in front of our eyes each week as we navigate this strange machine we call the internet. But sometimes those images are lying to us. The following lies are culled from the bits and bytes that came through the tubes over the past few weeks. 1) Are these school lunches from around the world? They look pretty delicious, but those "typical" school lunches from around the world aren't so typical. They're actually misleading promotional photos from an advertising campaign for a health food store called SweetGreen. 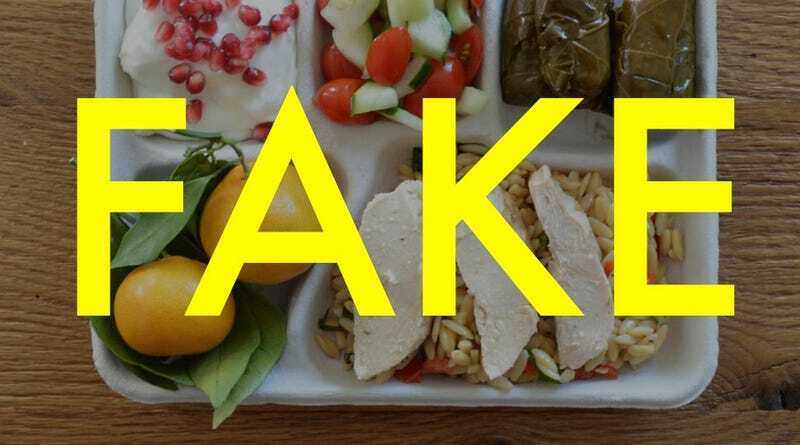 As Mother Jones points out, the photo purporting to show a typical school lunch in Greece should have been a big red flag. Sadly, given the country's financial woes, Greece doesn't have the resources to provide the kind of meal pictured. They point to an article in the New York Times that explains schools in Greece, "do not offer subsidized cafeteria lunches. Students bring their own food or buy items from a canteen." This isn't to say that American public schools aren't woefully lacking in nutrition compared with much of the industrialized world. But these staged photos are far from an honest depiction. SweetGreen updated their post to admit nearly as much, even if they hedged in the process: "These images are not intended to be exact representations of school lunches, but instead, are meant to portray different types of foods found in cafeterias around the world." 2) Is this a whale swimming through Venice? No, that's not a whale making its way through the canals of Venice. It's actually a composite image by artist Robert Jahns, who's responsible for another famous viral fake involving Venice freezing over. It's a cool picture, but not a true one. 3) Are these the tallest mountains on earth as seen from space? 4) Is this a whisky vending machine in a 1960s office? Yes, that's a whisky dispenser. But it's not from an office in the 1950s or 60s, as it's so often captioned. According to Getty, it's from a vending machine exhibition in London in 1960. We don't have any evidence that this machine was used in an office, no matter how badly we want to believe that's the case. Thanks to shows like Mad Men, people here in the 21st century have a tendency to think that everybody in the offices of the 1960s were constantly hammered. And while drinking on the job was more socially acceptable than it is today (at least for white collar workers at the highest ranks of companies), the people of the 1960s weren't constantly drinking. 5) Is this a creepy passageway in an abandoned church? On an unrelated (but hilarious) note, my favorite thing about the episode is when the host of the show steps into a local library and says, "I really don't think I've been in a library since grade school." 6) Is this a rare color photo of the attack on Pearl Harbor? PicPedant sets the record straight, explaining that the photo actually comes from a publicity still from the 2001 movie Pearl Harbor. That's right. The one with Ben Affleck. 7) Is this an Alaskan Tree Frog? As Hoax of Fame points out, there's actually no such thing as an Alaskan Tree Frog. The image is quite clearly a cartoonish frog on top of what I'm guessing is a stone heart. Frustratingly, I can't seem to find an example online. But I'm almost certain I've seen this one (in its non-frozen form) before. If you know where this frog comes from please let us know in the comments. Need more fakes? Check out the "kissing islands" of Greenland, the hippie hitchhikers of Woodstock, or the sci-fi Soviet beach that never was.